Finding the Lost Community of Raritan Landing ~ The History Girl! If you travel along River Road in Piscataway today, you will see Johnson Park which borders the Raritan River on one side and Rutgers Stadium on the other. What you do not see however, are the remains of a once bustling port community on the Raritan. Just a foot under the ground is a network of roads, foundations, wells, and artifacts that tell the story of a community that once was. Archeologists in recent years have been uncovering these artifacts and piecing together their story, in hopes of learning more about those who lived there and did business in this colonial town. Post-Revolutionary foundations above remains of earlier buildings at the corner of River Road and Landing Lane on the Reade/Bray property. There are no photographs of the buildings in Raritan Landing or pictures of the people who lived there. Through historical deed research and other preserved ephemera from the period, names and information about what occurred there has become known. Artifacts unearthed during investigations give us a closer look into how these early residents lived and spent their time. This small jug was made locally in New Jersey. It was recovered from a well on the Duyckinck/Van Ranst property in 2001. In the early 1700s, a small community was established on the Raritan River near New Brunswick. The spot was chosen because it was the furthest north that ships could travel up the river before it became too shallow to navigate. The Landing quickly emerged as the center for local trade and, along with New Brunswick, served as a hub for imports and exports to and from the Raritan Valley. Agricultural goods and lumber brought to Raritan Landing from throughout central New Jersey were stored in warehouses here, awaiting shipment to either New York or sometimes the Caribbean. Imported goods were off-loaded and taken by traders to stores and merchants throughout the area. One of the early landowners, Cornelius Low, (c. 1700–1777) recognized the economic potential of Raritan Landing. During the 1720s Cornelius Low was a successful merchant in Newark. He married Johanna Gouveneur in 1729 and they made plans to move to the emerging port community. Having experience in shipping, Low became one of the community’s most prosperous businessmen. During a freshet in 1738, Low’s home, located along the wharf near Landing Lane was severely flooded. By 1740, the settlement grew to include seventy structures and more than one hundred inhabitants. Homes, shops and warehouses lined what is today River Road and Landing Lane. Overlooking River Road and Landing Lane, where houses, shops and warehouses once stood. To avoid future flooding, Low purchased two acres of land from William Williamson for a new house on the bluff, opposite the Great Road (River Road) and overlooking the Landing. Low called his new home the “new house on the mountain.” The new location allowed Low to keep an eye on the activities at the wharves, and his warehouse located between the river and the Great Road. The house was completed in 1741. The house, Georgian in style, did not reflect the Dutch style of the other homes. The Georgian style of building was very popular in England at the time. The house was symmetrical, with a wide center hall, hipped roof, and eight rooms. A one-and-a-half story kitchen wing was also constructed. The Low house was built with more than 350 tons of sandstone, most likely quarried from the Newark area. While most of the homes at Raritan Landing had stone foundations, this was the only house to have been built entirely out of stone. Low wanted the front of his home to reflect his stature as one of the most influential and prosperous men of the community. In order to achieve that, he built a ledge, or sill course, approximately three feet up from the ground, which encircled the house. This sill course makes the house appear to be sitting on a pedestal. Low purchased large, rectangular cut stone blocks for the front façade. However, in order to save money, the finished stone was only used on the front side of the house facing Raritan Landing. The other three sides were built of less expensive rubble stone, or irregular pieces that required minimal finish work. The Cornelius Low House, constructed 1741. During the 1770s, Raritan Landing and the surrounding bluffs were occupied by British troops and sustained damage from the Revolutionary War. The Low House was spared damage because of Low’s loyalty to England. After the war, the community rebuilt itself. Landing Lane was once again lined with blacksmith shops, cooper shops, stores, and warehouses. The area continued to prosper. In the 1830s, the construction of Delaware and Raritan Canal and opening of railroad made it easier for goods to travel from the interior of New Jersey to the ports along the Raritan. Eventually, the warehouses were no longer necessary as goods no longer needed to be stored for long periods. By 1870, most of the community was dismantled and converted to pastureland. The village and its buildings slowly disappeared from the landscape. Cobble roadway linking River Road with eighteenth century structures on the Bray/Letson Meadow property. In 1936, local resident Cornelius C. Vermeule, developed a map reconstruction of Raritan Landing based on his research and family recollections. Vermeule was very interested in the history of the Raritan Valley. His work was published by the NJ Historical Society. It was not until the 1970s that Raritan Landing was rediscovered. The New Jersey Department of Transportation conducted archeological investigations in 1977 in the area for the proposed Landing Lane bridge replacement and road realignment. During these investigations the NJDOT archaeologists recovered 18th and early 19th-century artifacts and exposed a foundation. In 1978, the Rutgers Archaeological Survey Office (RASO) excavated near the corner of Landing Lane and River Road within the alignment of a proposed sewer line that would parallel River Road. The Rutgers team uncovered foundations and 18th-century artifacts. As a result of RASO's work and additional investigations involving the use of ground penetrating radar, property along River Road and Landing Lane was designated as the Raritan Landing Archaeological District. The district was then listed on the New Jersey and National Registers of Historic Places in 1979. 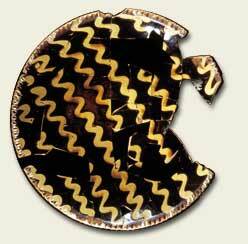 Slip-decorated buff earthenware pieplate recovered at Raritan Landing in 1979. For the sewer line project, RASO exposed four building foundations and recovered thousands of artifacts. Additional work by NJDOT archaeologists in 1980 extended the boundaries of the archaeological district and, in 1984, identified additional sites. 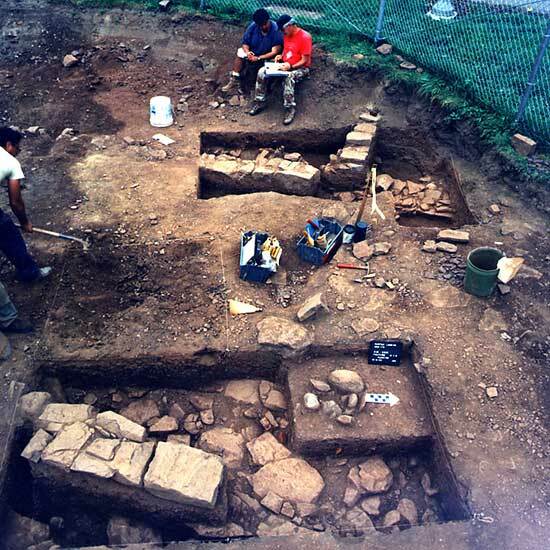 In 1993, excavations at the intersection of Landing Lane and River Road by NJDOT and Rutgers University's Center for Public Archaeology uncovered part of the foundation wall of a large 18th-century warehouse. In conjunction with Hunter Research, the Center excavated a swath of land along the north side of River Road where a well and part of the foundation of another warehouse or a barn were located. 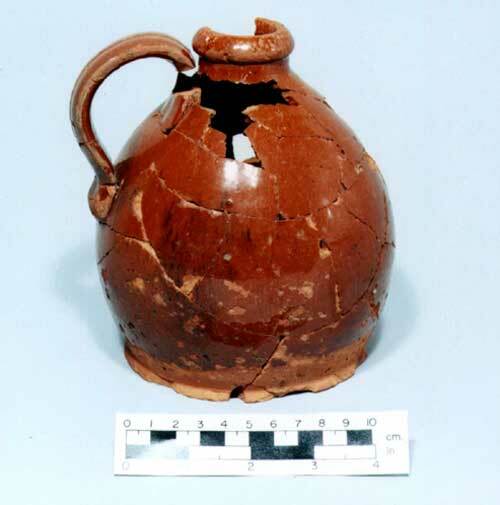 Between 1992 and 1994, excavations by the Center examined several foundations, recovered numerous domestic, commercial, and military artifacts, and identified a possible British encampment. 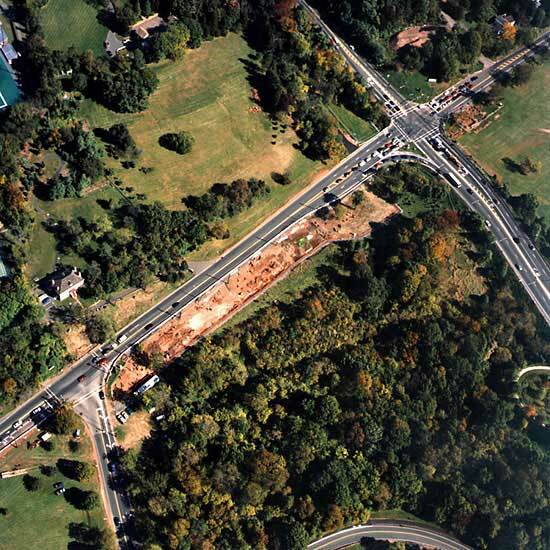 In 2000, in conjunction with the Route 18 extension project, several firms investigated Raritan Landing once again, focusing on properties along River Road, across from the Low House. The archaeological sites along River Road between Route 18 and Landing Lane in 2000. Finally, in 2008, the most recent investigations into Raritan Landing occurred. This time, Rutgers was expanding its stadium adjacent to River Road. The new stadium entrance plaza on River Road was once home to the Rising Sun Tavern and an early eighteenth century home thought to be the Van Tine House. 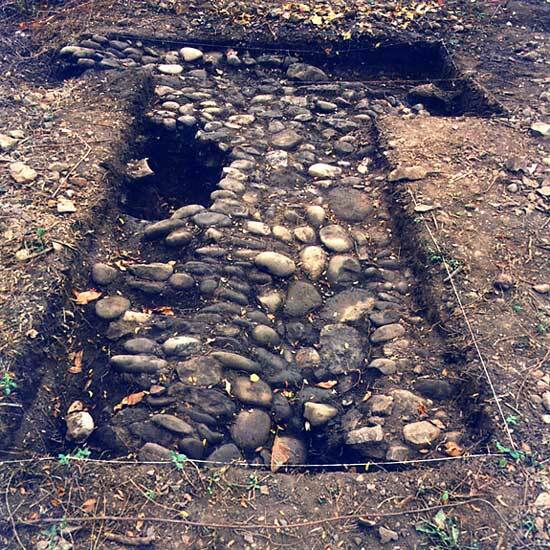 During investigations, the tavern foundation and a well for the tavern was discovered, along with oyster and clam shell deposits, indicating the tavern fare of the late 1700s. Today a lone historic marker sits in Johnson Park, marking the area that once was a bustling river community. Within the view of the marker, one can still see Cornelius Low’s home on the bluff, today Middlesex County’s museum, and Rutgers stadium, a testament to progress. The only other remaining structure from Raritan Landing, the Bodine-Metlar House, constructed 1728, is situated on the other side of Route 18 along River Road. While the community is no longer visible, the archaeological discoveries made in the past thirty-five years have helped retell the story of Raritan Landing and its people. The lone marker in Johnson Park, paying homage to what once was. This is a terrific recap. Thanks for the interesting article.